Giving birth to a centre for liberal arts in a popular neighborhood of Cairo, which is covered in layers of stories, sounds, movements and smells, was a deliberate choice. 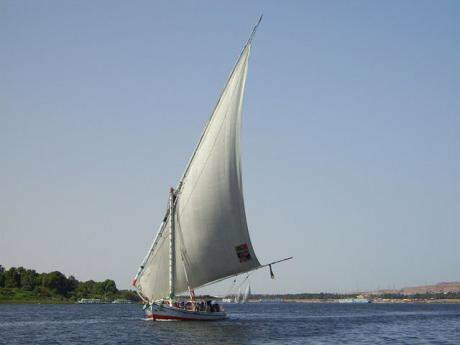 Faluka on the Nile, 2008. Wikicommons/Ocean Star. Some rights reserved.This is another interview in a series on the dilemmas and contradictions researchers encounter in undertaking research in the Middle East. The idea of interviewing social scientists on the processes of the production of knowledge has been inspired from Michael Burawoy’s concept of ‘public sociology’, which he initiated and was followed by other sociologists who carried out further interviews with social scientists in ‘Global Dialogue’. Mona Abaza (MA): Karim, can you introduce your work, and the driving idea behind the Cairo Institute of Liberal Arts and Sciences (CILAS)? Karim-Yassin Goessinger (K-Y.G): CILAS now operates as a scholarly cooperative guided by the principles of play, radical equality, ignorance, post-disciplinarity and diversity. This synthesis was informed by my mostly joyous academic training in political philosophy, social anthropology and urban sociology and my predominantly disillusioning insights into the development world. I've served as founding director and teaching fellow at CILAS with a short gig with the Sociology Unit at the American University in Cairo, and am currently considering moving across the African continent to continue doing similarly meaningful work in Johannesburg, South Africa starting in the summer. Recent talks I’ve given were at a critical geography conference in Ramallah on the global emergence of liberal arts educations in relation to space; on aesthetic education and the importance of play (grounds) at the Dutch Institute in Cairo; and on the task of the liberal educator at a conference on liberal education at the University of Chicago. MA: So how would you summarize the major lines of your work? K-Y.G: I suppose my work could be summed up in two steps. The first step is to cater in food for thought either for those left undernourished by the traditional (read modern/colonial) university, people denied access to university altogether or who refuse to "waste time" at a traditional university. The second step is to provide sufficient shelter in a neighborhood to make it effectively accessible to people from different walks of life to assemble around a meal (a range of topics) and eat together (contemplate and co-create knowledge). I created the Cairo Institute of Liberal Arts and Sciences, CILAS, -– first and foremost as a liberal arts-focused space – in appreciation of the tradition of the liberal arts which I was fortunate to have access to; and out of a sense of responsibility stemming from a sense of belonging to the Egyptian people in their entirety, beyond the confines of class and citizenship. CILAS has been inviting students on ten-month long faluka (an ancient Egyptian sail boat) rides; hence, the image of the faluka as portrayed in CILAS' logo. Less poetically stated, CILAS has been inviting students to engage with the liberal arts from within a pedagogy of discovery. It's precisely this un-wrappability or un-packageability that helps the liberal arts escape turning into a consumer product. The liberal arts are tricky to wrap up in one bundle but it's precisely this un-wrappability or un-packageability that helps the liberal arts escape turning into a consumer product. It therefore goes without saying that an invitation to engage with the liberal arts is one that must operate within a pedagogy of discovery as opposed to the pedagogy of consumption that is becoming common currency in light of the corporatization of higher education. The metaphor of the faluka resonated with me loudly and clearly when conceiving of CILAS, as I hastened to leave the so-called development world behind which had felt much too blatantly like a neo-colonial voyage on a cruise ship. This is how, together with E.F. Schumacher, I embraced the beauty of smallness and was drawn into sailing along the Nile rather than contributing to the command of yet another colonial voyage. Our mission statement as first formulated for CILAS was to offer students from diverse socio-economic backgrounds access to a liberal arts education. The vision, as first articulated, was to co-create a learning environment that would be conducive to critical inquiry, self-reflection and civic engagement. The immediacy of this statement served as a reminder of the social solidarity that had crystallized as part of the revolutionary momentum of the times. The vision was an implicit call for action to re-appropriate space in an effort to honor the generative force released during that revolutionary moment. Both the statement and vision played on the idea of grounding the liberal arts; of transforming them from something remote, mistakenly vague, void of instrumental value, liberal – carrying as it did a vilified connotation in Egypt's post-revolutionary, politicized climate – into something, well, artsy, that is, generating no practical, i.e. monetary, outcome. So much for step one. With regards to step two, it occurred to me that the revolution had spurred on the formation of reading circles and discussion groups that covered a wide array of topics relating to the potentials of the historical juncture presenting itself to Egypt's youth. What I noticed at the time is that many of the initiatives often came to an abrupt end within one to three months. I felt that an inviting and warm space paired with a loose program structure could do the trick in enticing eager learners to pull through despite the lack of formal recognition (accreditation). Indeed, the loose structure consisting of a fairly intense core curriculum and thematic coursework that would respond to students’ concerns and questions struck the balance between intellectually challenging and imposed, and intellectually intriguing and self-directed. The intellectual pillar of CILAS' philosophy was complemented with an experiential component… we promote community service. The intellectual pillar of CILAS' philosophy was complemented with an experiential component in which students took CILAS' core curriculum, revised it and taught it to adult refugees affiliated with St. Andrew's Refugee Services; other students decided to conduct individual research. In both cases, I interpreted a notion of experiential learning best formulated, I thought, by the California Institute of Integral Studies (where I have since taken tea) in such a way as to emphasize the notion of service to one’s community. Put simply, we promote community service. Hence, both the so-called pedagogical track, which has since turned into an ongoing and self-organized effort, and the research track were from the outset projects aimed at fostering collaboration across difference, the sharing of insight and the co-creation of knowledge, be it between CILAS' emerging pedagogues and adult learners or CILAS' aspiring researchers and their sources or counter-parts in other ways. CILAS' yearlong study program would culminate in an end-of-year student-led conference during which emerging pedagogues offered reflections and findings on their teaching experience, recognizing the moving and breathing nature of their intervention. Aspiring researchers reflected on their research experience as a continuous process of generating preliminary insights along the way. MA: How did you manage such a project administratively ? K-Y.G: I registered an NGO in 2013 – the year of CILAS' inauguration – under the name 'mubadrat iktishaf al-zaat lel tanmeya' ( The Inititiative of self discovery for Development). It wouldn't have been possible to set up a 'ma'had' (Institute) or a 'markaz' (center) without obtaining a license from the Ministry of Higher Education and the Ministry of Culture, respectively. Hence, the choice to register a generic initiative. However, I was convinced that the name would make all the difference to prospective students and insisted on Cairo Institute of Liberal Arts and Sciences. This has been a gamble since the beginning and returned to haunt me later on, notably around the fifth anniversary of the revolution and the heightened crackdown on civil society. Any inconsistency could have gotten me into trouble. Throughout this time we had among us foreign teaching fellows for whom we couldn't obtain work permits, which, in turn, made book-keeping an act of wizardry. In addition, we were denied a substantial grant that would have allowed us to focus and expand on our work for no less than two years, issued by the Ford Foundation, but turned down through the Ministry of Foreign Affairs. It was said to me at the time that all foreign funding was automatically turned down. The list of problems or hurdles in creating CILAS was endless; even recollecting them is awfully frustrating. M.A How long did it take you to create CILAS and how then did you keep going? K-Y.G: I conceptualized and created the underlying structure and processes over a period of a year. That is to say, I consulted with people in the fields of higher education, art, culture, and notably civil society law for three months before deciding to try my luck. I say luck because everyone I consulted from university presidents to cultural managers with years of experience in Cairo advised me against carrying on, yet wished me luck. Everyone I consulted in Cairo advised me against carrying on, yet wished me luck. I got in touch with friends at Stanford to seek advice on creating a user-friendly and clean (minimalist) website; took to the streets to make friends with bawabeen to eventually land a space; hired two interns to help with reaching out to potential teaching fellows; and arranged info sessions on CILAS across town. In parallel, I hired a lawyer to help me set up an NGO -- the status I opted for after months of hesitation and ambivalence. I made it a point to accompany the lawyer along the red tape in order to get a feel for Egyptian bureaucracy, with which I'm now most intimate. In late spring of 2013, I had started renting a floor in a building that had been home to the Centre for Egyptian Civilization Studies and was under the authority of the Ministry of Awqaf (Endowments) in al-Ghuria. There is no doubt about the fact that CILAS' location sitting on top of the Centre for Egyptian Civilization Studies just behind the al-Ghuri complex gave it that particular feel and flavor. Considered and referred to as a popular neighbourhood if not an informal ('ashwa'i) = (slum) by members of the upper middle class, al-Ghuria is part and parcel of the larger al-Hussein area home to al-Azhar University and Khan al Khalili bazaar. Few people have heard the name al-Ghuria in relation to the weekly Sufi dance performances at al-Ghuria's caravansarai (wekala). Similar people with an eye for Islamic architecture might venture through al-Ghuria to visit the medieval gates surrounding Islamic Cairo or to reach al-Khaymiyya – the tentmakers' workshops. Al-Ghuria is vibrant. Its bustling corridors are dressed in everything from nightgowns and lingerie, to sandals, kitchen utensils and blankets. The former and the latter is what attract brides-to-be and their mothers, aunts and girlfriends to openly shop for blankets and perhaps a bit more selectively and discretely for underwear. 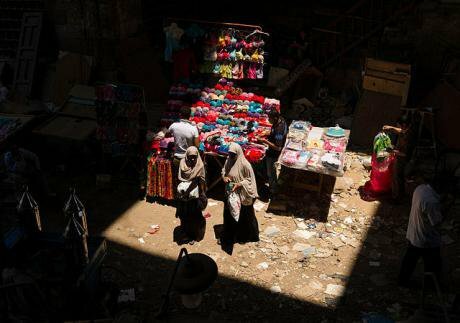 Two Egyptian women shop at a market near the Al-Ghouri complex in Cairo, Egypt, July 2012. Wikicommons/Frank Schulenburg. Some rights reserved.Everybody in al-Ghuria got to know us; from the shop owners to the pusher of wheelbarrows transporting incoming goods from al-Azhar street into the deep veins of al-Ghuria, to the bicycle riders carrying stacks of baladi bread on trays on top of their hats to provide cover for the deep-fried vegetables we'd indulge in on CILAS' terrace. There is, again, no doubt that for those who managed to get there, whether by foot or by Suzuki crossing over from al-Attaba, al-Ghuria was a fun experience. Parking a private vehicle in the area wasn't straightforward. It required advanced negotiation skill and deep-seated trust. The area was after all known to supply hashish and panadol, among other things. You'd see a junkie here and there. Some mistook us for tourists, became our friends and joined us for those deep-fried cauliflower sandwiches. Al-Ghuria was also frequented by (Southeast) Asian and (west) African Azhar students, some of whom set up food places for their respective student communities. As CILASians we felt welcome at both the Muslim Chinese restaurant run by two brothers from China in the al-Darassa quarter, and at the Indonesian restaurant without a name and a floating menu deeply-nested in our very own neighborhood. All of this enriched, spiced up and entertained the learning experience at CILAS. It put things into perspective. It would instill concepts with life, fuel debates and ground us all again as we descended the two flights of stairs. It also shook up the whole tradition of the liberal arts, which in my imagination is a tradition that prides itself on sitting somewhere rather remote under a tree ruminating over the purpose and meaning of life. And while I cherish this image and appreciate the tradition I felt it too remote to be tasted, touched and told in post-revolutionary Egypt, especially in a place like Cairo in all its nosy- and noisy-ness. Giving birth to CILAS in a popular neighborhood, which is covered in layers of stories, sounds, movements and smells was a deliberate choice. It was an attempt to socio-spatially embed the liberal arts and to ground its operations. Al-Ghouri complex, 2015. Wikicommons/ Sailko. Some rights reserved.